years ago gave the child’s family another surprise – a special gift just in time for the holidays. Six years ago, Mort responded to a call – two-year-old Jacob had fallen into the family’s pool. “When I went to go help him, Jacob was very heavy, full of water purple and blue, and he wasn’t breathing,” said Stephanie Pardo, Jacob’s mother. Mort and a paramedic began CPR on the toddler. 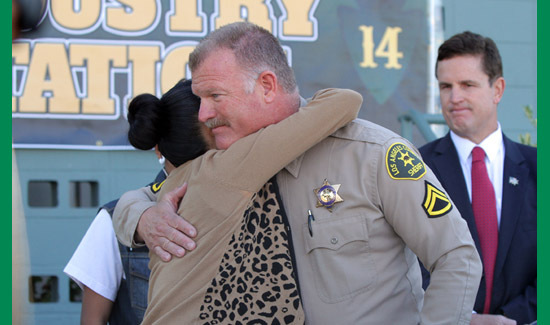 “During this time, I could hear the other deputies kept telling him, ‘Call time. Deputy, call time,’ and he wouldn’t give up. He wouldn’t give up on him,” Pardo said. Knowing that little Jacob couldn’t wait for an ambulance, Mort acted quickly. “The paramedic picked up Jacob. He got in the backseat of my car, my radio car, and I drove him and Jacob to the hospital,” Mort said. Jacob sustained severe brain damage but was alive. For that, his mother is eternally grateful. Jacob and not giving up on him,” Pardo said. Mort said it means a lot to him that Jacob’s mother calls him every year. “It’s kept this call ongoing,” Mort said.